subgenus Pinus, section Pinus, subsection Pinaster (Mayr ex Koehne). Pinus roxburghii, as described in 1897 by Charles Sprague Sargent (1841–1927), in The Silva of North America, vol. 11:9, is commonly known as Chir pine, Indian long-leaf pine or Imodi pine; as well as, चीड (chir) in the Hindi language; as 西藏长叶松 (xu mi chang ye song) in Chinese; as ചരളം in Malay; as Khote sallo in Nepali; and as Sarala in Sanskrit. The species name honors William Roxburgh (1751 - 1815), a Scottish surgeon and botanist who worked extensively in India, describing species and working on economic botany. He is known as the founding father of Indian botany. Ethnobotany. The timber is used for construction, furniture, etc., and the trunk as a source of resin. Description. 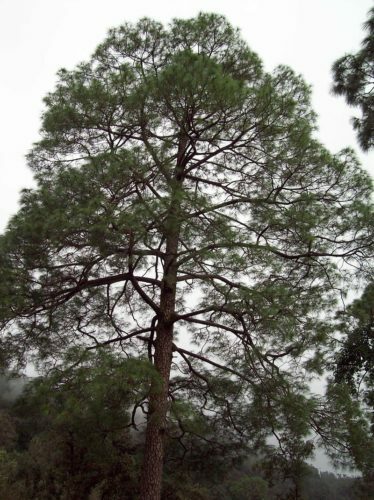 Chir pine is an evergreen, coniferous species of tree that grows to mature heights of 180 feet (55 m) with a trunk over 60 inches (100 cm) in diameter, measuring at breast height; and an open, shallow, dome-shaped crown. 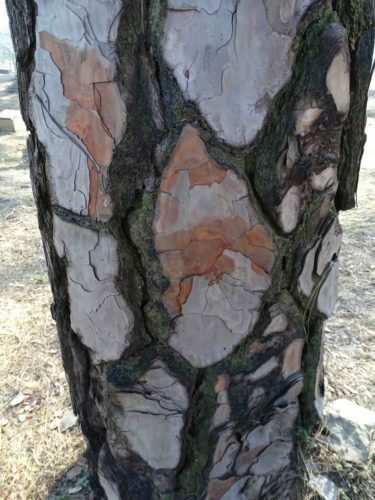 Bark is dark red-brown, thick, scaly and deeply / longitudinally fissured. Foliar buds are small, brown, ovoid shaped and not resinous. Leaves (needles) are borne 3 per bundle. Individual needles are light-green in color, slender, flabellate-triangular in cross section, measuring 8 to 12 inches (20 - 30 cm) long by 0.06 inch (1.5 mm) thick, with 2 resin canals. Foliar sheaths are 0.8 to 1.2 inches (2 - 3 cm) long and persistent for the life of the foliar unit. Pollen cones are borne in dense clusters, yellowish brown in color; each measuring 0.4 to 0.8 inch (1 - 2 cm). Seed cones are shortly pedunculate, ovoid shaped, measuring 4 to 8 inches (10 - 20 cm) long by 2.4 to 3.6 inches (6 - 9 cm) wide. Seed scales are oblong, stiff and thick. Apophyses are strongly swollen, conspicuously transversely ridged. Umbos are triangular and protruding. Seeds measure 0.32 to 0.48 inch (8 - 12 mm) long, with a wing measuring circa (1 inch) 2.5 cm long. Seed maturity is from October to November. Distribution. This species is native to the Himalayan mountains — Bhutan; India — Jammu and Kashmir, Punjab, Himanchal Pradesh, Uttarakhand; Nepal; Pakistan; Sikkim; Afghasistan; and southern Tibet; growing in the mountains at elevations of 1,500 to 7,500 feet (450 - 2300 m) above sea level. It is limited to the monsoon belt between 72° and 95°E and 27° and 35°N. Within its range, it is not only a common species, but is also the most widely planted conifer, comprising 17% of the forested area of Nepal. Attribution from: Zheng-yi Wu and Peter H. Raven (editors); Flora of China, Volume 4; ©1999, Science Press, Beijing; Missouri Botanical Garden, St. Louis, MO. 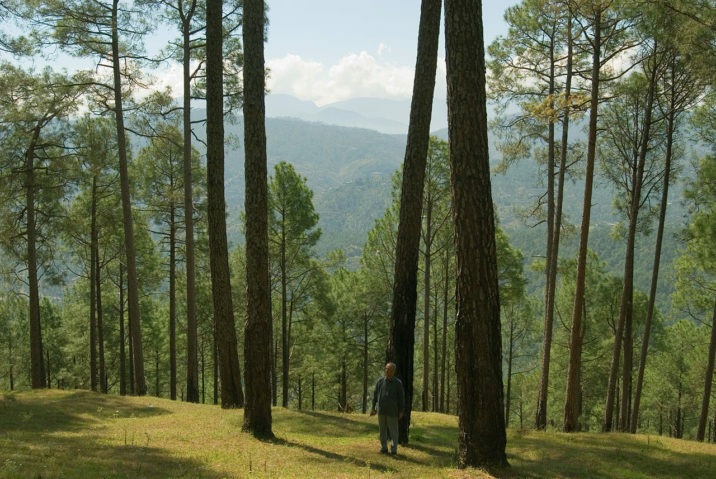 Pinus roxburghii — a large tree in habitat in Uttarakhand, India. 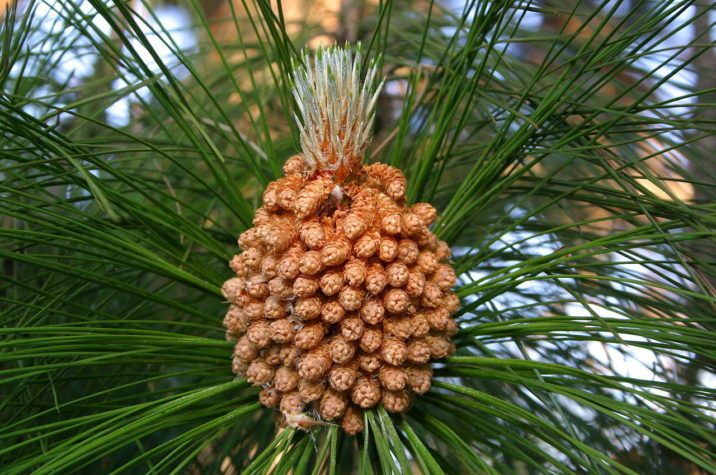 Pinus roxburghii — foliage and pollen cone detail. Photo by Paul Venter via Wikipedia; Public Domain photo. 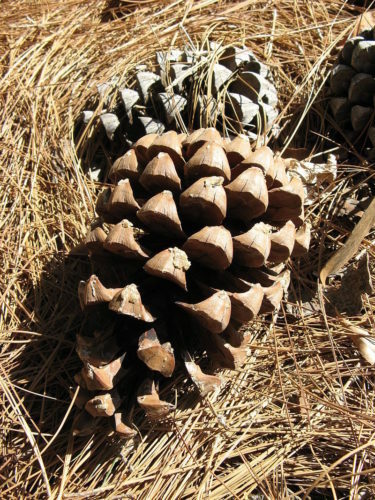 Pinus roxburghii — seed cone detail. Pinus roxburghii — bark detail, Kasauli, India.